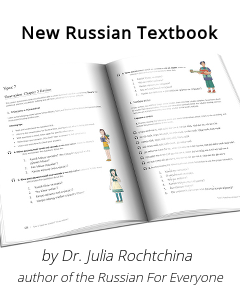 About us New Russian Textbook Want to donate? The University of Victoria, BC offers a unique opportunity to have your Russian language skills assessed and to receive internationally recognized Russian Language Proficiency Certificate issued by the Lomonosov Moscow State University. The Test of Russian as a Foreign Language (TORFL) examinations will take place at UVic on April 27-28. You are welcome to arrive to Victoria 3 days earlier and participate in our 8 hour exam training session on campus (no extra charge, this is included in your exam fee). TORFL is the only certification recognized by the Russian government that allows people to work in Russian and international companies in Russia. This certification and its six proficiency levels (from A1 to C2) is common across 47 languages, including most European languages. To learn more about TORFL examinations and find out what level you are, visit our Testing Centre website: http://hcmc.uvic.ca/torfl. Both non-heritage learners and heritage speakers are welcome! Developed by Dr. Julia Rochtchina. Quiz 1 Check what you have learned from Lessons 1-3 with this 10 minute quiz. Quiz 2 Check what you have learned from Lessons 4-6 with this 15 minute quiz. Quiz 3 Check what you have learned from Lessons 7-8 with this 15 minute quiz. Quiz 4 Check what you have learned from Lessons 7-8 with this 10 minute quiz. Quiz 5 Check what you have learned from Grammar Lessons 1-4 and Phrasebook Topics 3-4 with this 20 minute quiz. Quiz 6 Check what you have learned from Grammar Lessons 5-6 and Phrasebook Topics 5-6 with this 10 minute quiz. Quiz 7 Check what you have learned from Grammar Lessons 7-8 and Phrasebook Topic 7 with this 10 minute quiz. Test 2 Check what you have learned from Grammar Lessons 5-8 and Phrasebook Topics 5-8. Quiz 8 (Week 6) Check what you have learned from Grammar Lessons 9-10 and Phrasebook Topics 9-10 with this 10 minute quiz. Quiz 9 Check what you have learned from Grammar Lessons 11-12 with this 10 minute quiz. Test 3 Check what you have learned from Grammar Lessons 9-12 and Phrasebook Topics 9-10. Quiz 10 Check what you have learned from Grammar Lessons 13-14 and Phrasebook Topic 11 with this 10 minute quiz. Quiz 11 Check what you have learned from Grammar Lessons 15-17 and Phrasebook Topics 13-14 with this 10 minute quiz. Test 4 Check what you have learned from Grammar Lessons 13-17 and Phrasebook Topics 11-14. Quiz 12 Check what you have learned from Grammar Lessons 18-19 and Phrasebook Topics 15 with this 15 minute quiz. Quiz 13 Check what you have learned from Grammar Lessons 20-21 and Phrasebook Topics 16 with this 15 minute quiz. Test 5 Check what you have learned from Grammar Lessons 18-21 and Phrasebook Topics 15-16. Grammar Lesson 22 Expressing Possession: Genitive Case of Nouns (introduction). Uses and Singular forms. Question Чей? - Whose? Quiz 14 Check what you have learned from Grammar Lessons 22-24 and Phrasebook Topics 17 with this 15 minute quiz. Grammar Lesson 25 Verbs of Going (introduction). Going by foot vs. going by vehicle. Saying "Let's go!". Asking Where: Где? vs. Куда? Quiz 15 Check what you have learned from Grammar Lessons 25-27 and Phrasebook Topic 17 with this 15 minute quiz. Test 6 Check what you have learned from Grammar Lessons 22-27 and Phrasebook Topic 17. Grammar Lesson 31 The Instrumental Case of Nouns. The Instrumental Case of Personal Pronouns. Uses and forms. Quiz 16 Check what you have learned from Grammar Lessons 28-32 with this 15 minute quiz. Test 7 Check what you have learned from Grammar Lessons 28-32. 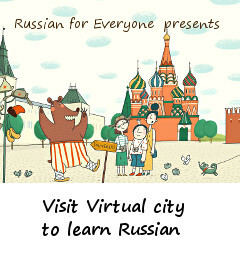 Noun and Adjective Endings Russian Nominative, Prepositional, Accusative, Genitive, Dative, Instrumental cases. Summary of Case Uses. Basic uses of Nominative, Prepositional, Accusative, Genitive, Dative, Instrumental cases. Verb Endings Verb Endings: First and Second conjugation. Regular Forms.